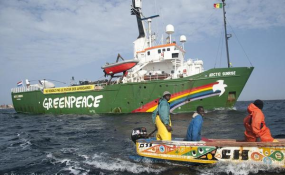 Greenpeace and Senegalese Fishermen Tackle Overfishing. Marine security, overfishing, dumping of toxic waste, piracy and unregulated mining topped the agenda of the Sustainable Blue Economy Conference in Nairobi this past week, with participants saying fixing these issues would accelerate economic growth. The over 15,000 delegates agreed that enhanced marine security will boost the Blue Economy, create jobs and help in the fight against poverty. This calls for countries to act locally but think regionally and globally through new marine policies and laws on illegal fishing, pollution of water bodies and the sharing of water resources. The conference recommended promotion of economic activities consistent with conservation around all water bodies; the formulation of maritime polices that are based on scientific data, support growth of small and medium enterprises in the Blue Economy, and embrace research and teaching programmes related to marine and coastal environments. The African maritime industry -- fisheries, marine transport, offshore mining and tourism -- is estimated to be worth $1 trillion a year worth, but is not fully exploited or protected. For instance, the continent loses $1.3 billion annually to illegal fishing, especially off the coast of Somalia. Africa, unlike European and Asian regions, still needs huge financial inputs for the development of Blue Economy infrastructure and deal with challenges such as illegal fishing, insecurity, toxic dumping, unsustainable mineral extraction and the negative impacts of climate change on marine biodiversity. Karmenu Vella, the European Union commissioner for environment and maritime affairs, said that the EU is ready to work with African coastal countries to fight illegal fishing and strengthen their control systems to increase healthier stocks, improve food security and provide more fishing opportunities for local fishermen. The EU already has Sustainable Fisheries Partnership Agreements with Morocco, Mauritius, Senegal and Seychelles that provide financial and technical support in exchange for fishing of sustainable stocks in the countries' territorial waters. The EU is negotiating an alliance with at least 50 African countries. This is expected to create up to 10 million jobs in Africa in the next five years, according to Mr Vella. In the EU, the Blue Economy generates 640 billion euros and creates jobs for nearly 3.5 million people. Isabella Lovin, Swedish deputy Prime Minister and the minister for international development co-operation and climate, said that her country has offered $33.3 million to fight the effects of climate change on the Marine environment such as rise in sea temperatures, depletion of oxygen in the oceans and the death of coral reefs. It emerged that most African countries lack the resources to implement the International Convention for the Prevention of Pollution from Ships (Marpol) because they cannot afford new, cleaner technologies. But the biggest constraint for African countries is the inability to maintain marine security to deal with illegal fishing, piracy and toxic dumping. Michelle Stallone, a maritime security expert who has worked in East Africa for the past 10 years, said that existing international conventions on maritime security have gaps in enforcement because of lack of infrastructure and resources. She said that fishery strategies must be formulated in collaboration with law enforcement agencies and transport. "Information sharing among different government agencies and among countries of the region is crucial to the implementation of maritime laws. But due to financial constraints, many countries don't have enough vessels to patrol the waters. It means that joint patrols are the answer to overfishing, piracy, pollution, said Ms Stallone. Raychelle Omamo, Kenya's Cabinet Secretary for Defence said that maritime security must be seen in relation to national, human and regional security as well youth employment. She said that there are dozens of navies patrolling the Gulf Of Eden but thousands of youth along the East African coast are unemployed and idle, forcing them to resort to criminal activities. "The Western Indian Ocean has the longest coastline and governments don't have the capacity to monitor it. We need the private sector and regional co-operation, but we have to take into account foreign interests in our coastlines too," said Ms Omamo.